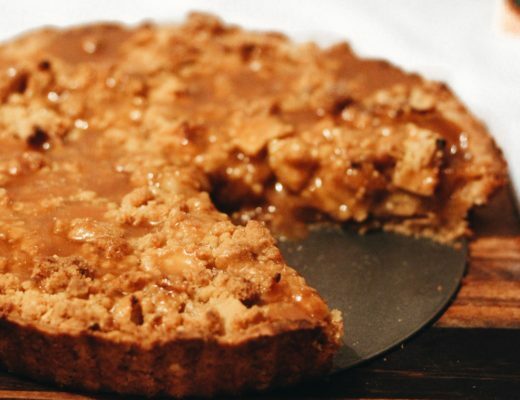 This deliciously more-ish dessert is incredibly easy to make and makes a great end to a meal. You can’t go wrong with a cheesecake and so it was my dessert of choice for our family Easter lunch (Quick question: is cheesecake a pie or a cake?!). Inspiration for the flavour came from the huge box of strawberries my dad had bought and of course, we’re getting into spring so fresh fruit is always a winner. Crush the digestive biscuits into crumbs (the fun part!) I did this by putting the biscuits into a plastic bag, sealing it and using a rolling pin to crush and smash. 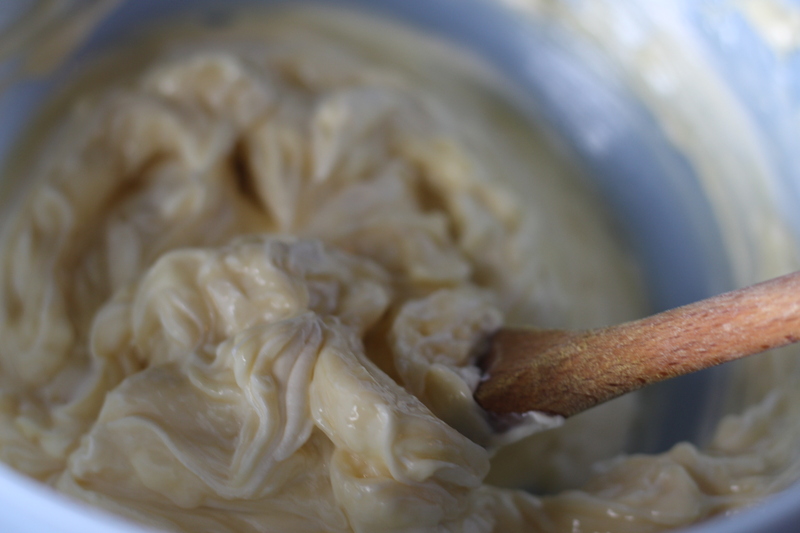 Melt the butter on a medium heat in a saucepan and combine the crumbs and butter in a bowl. 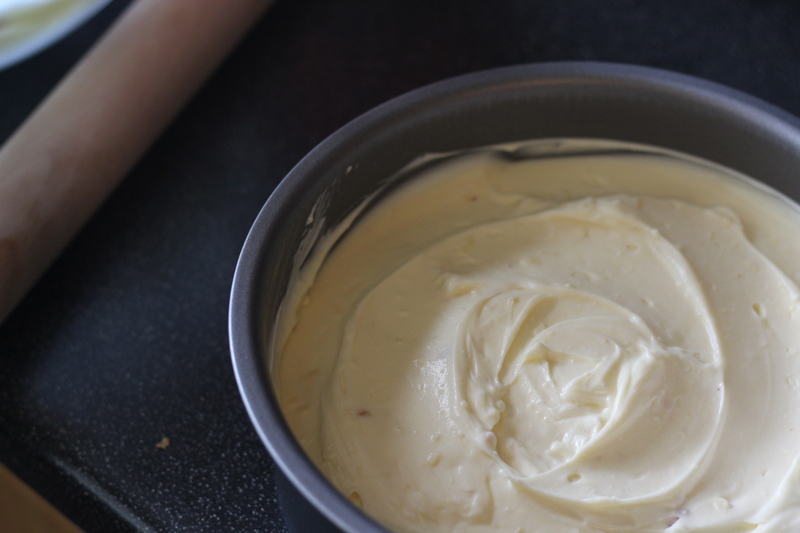 Press the biscuit mixture into the bottom of your cake/pie tin until firm and even and place in the fridge. 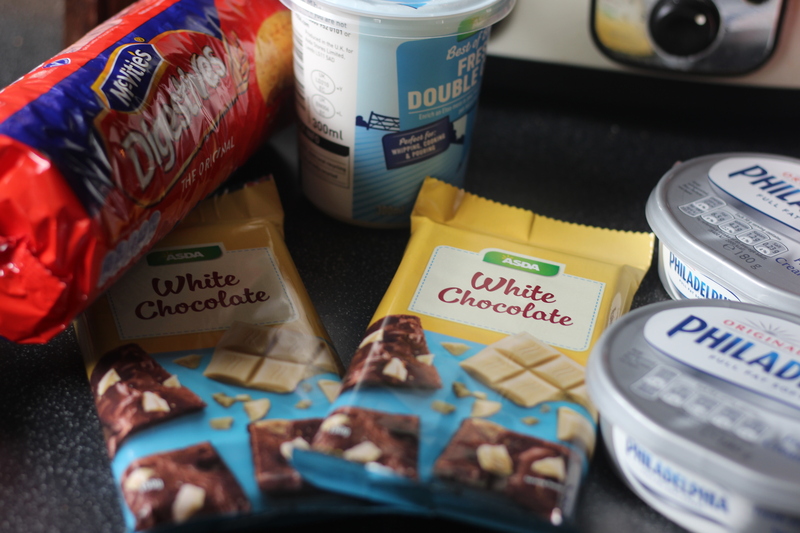 Next, mix the cream cheese and double cream well. 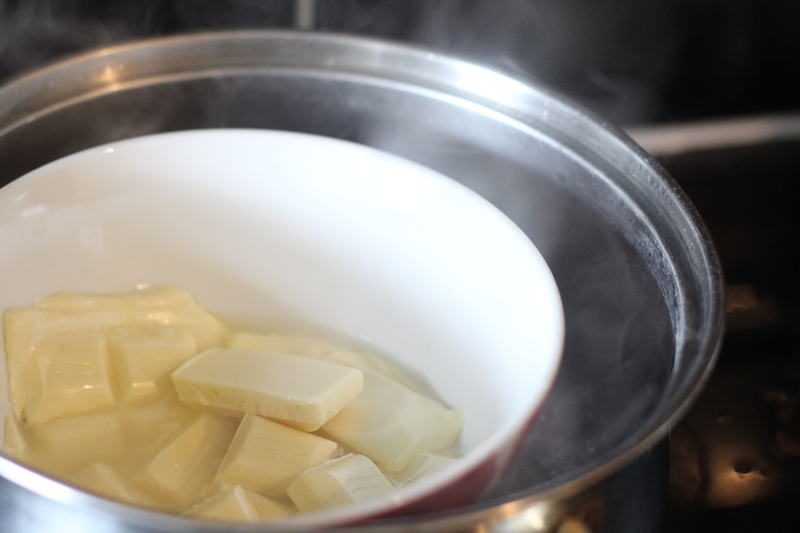 Gently melt 200g of the white chocolate by placing it in a bowl and into a saucepan of boiling water. 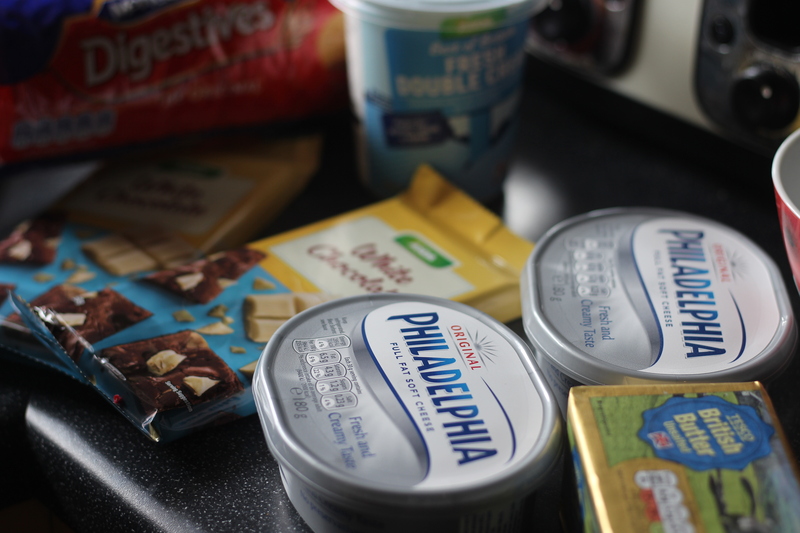 Once melted, fold the melted chocolate into the cream cheese mixture. 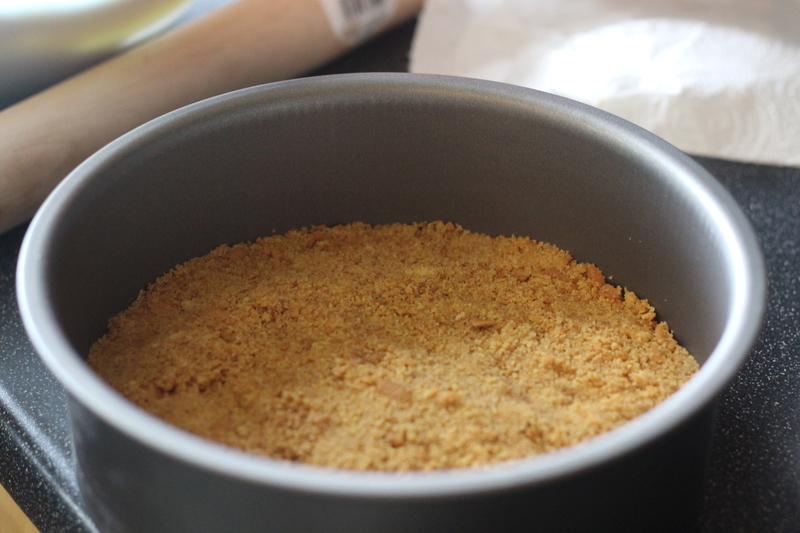 Once your cream cheese mixture is blended, remove your biscuit base from the fridge and layer the mixture on top, taking care not to lift up the crumb base. 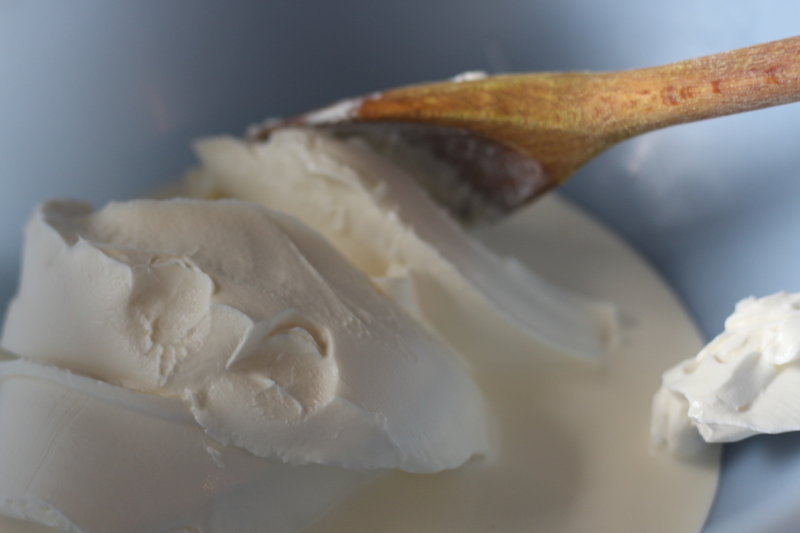 Smooth and spread with a spatula or the back of a spoon. 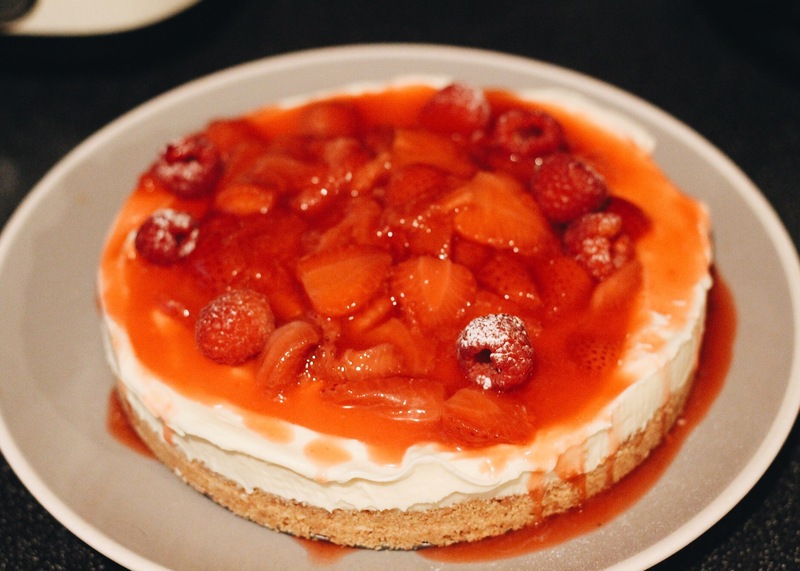 Put the cheesecake in the fridge for at least 3hrs or overnight. 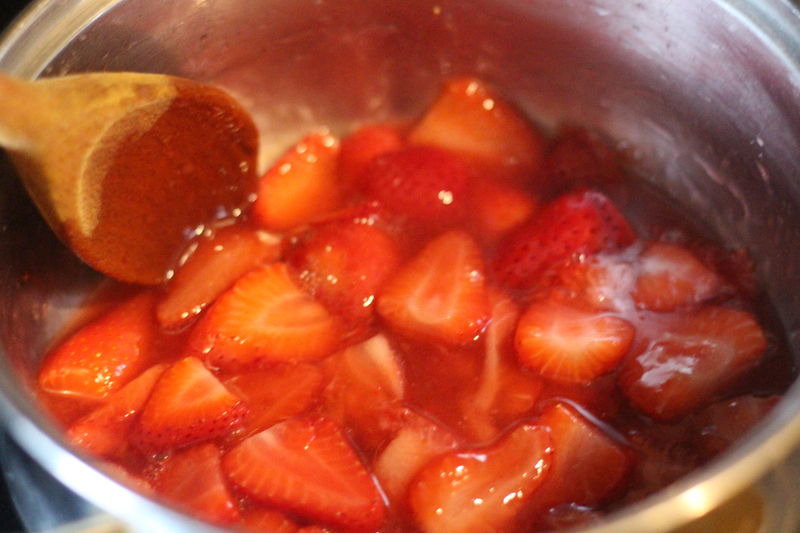 In the meantime, you can make the (super easy) strawberry sauce. Wash, de-stalk and slice the strawberries (I used enough to fill a small saucepan). Add them to a saucepan on a medium heat, along with 3tbsp of sugar. 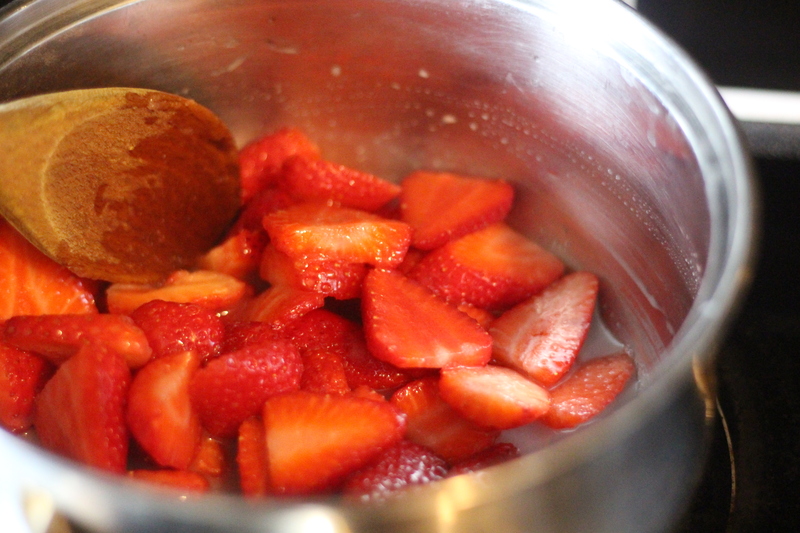 Separately, mix 1tbsp of cornstarch with water until it it dissolved and add this to the strawberries. This will help to thicken the sauce. 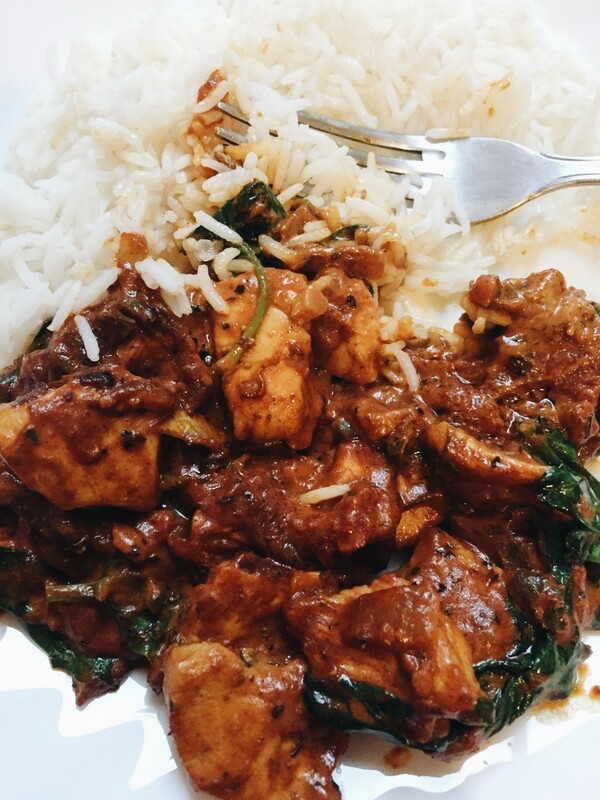 Stir gently until you have a syrupy sauce. 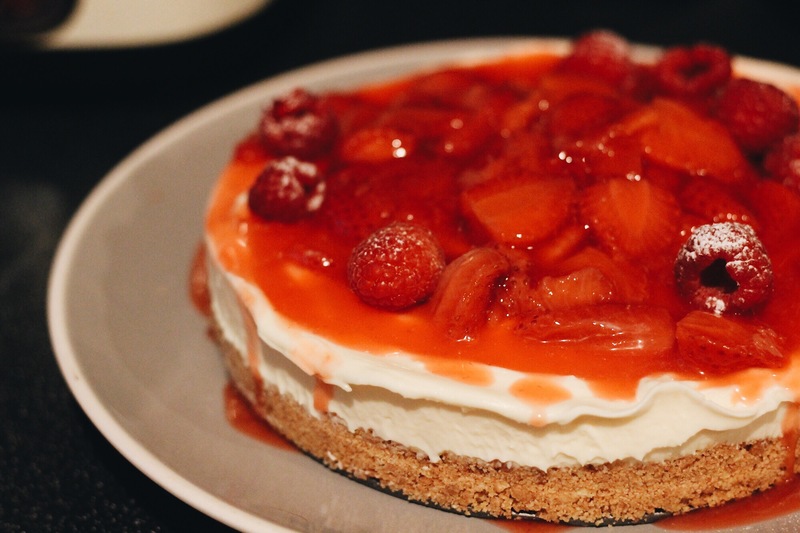 Leave to cool and store in the fridge until you are ready to serve the cheesecake. 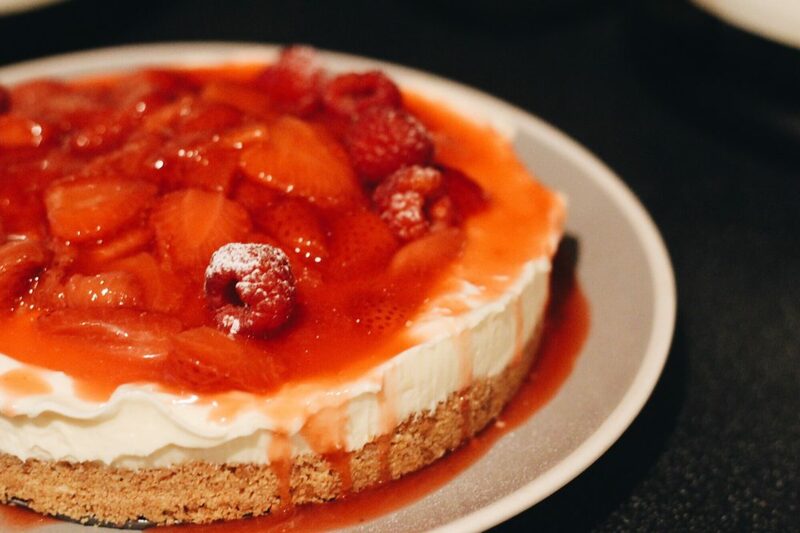 Once the cheesecake is firm (I put mine in the freezer for the last hour of the 4), you can remove it from the tin, pour the sauce on top and serve immediately! I added some raspberries and icing sugar too for some extra sweetness. 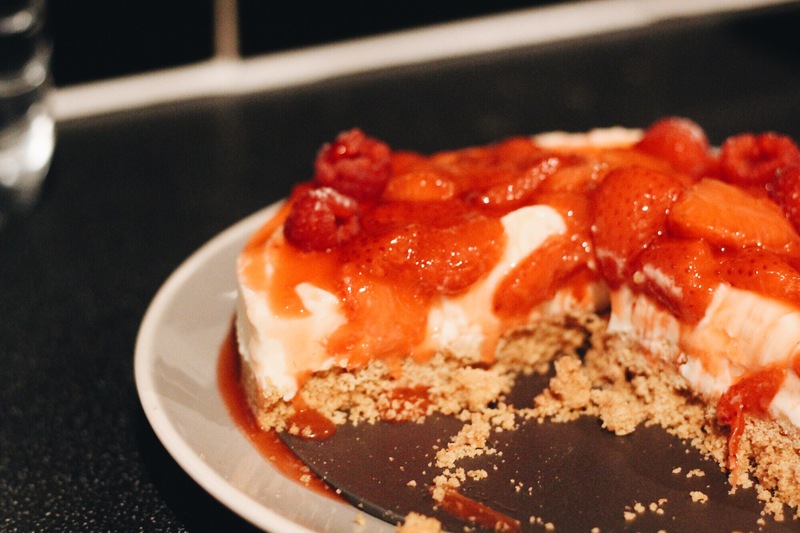 The great thing about this cheesecake is that you can experiment with different sauces and toppings like an Oreo crumble or salted caramel. Go wild 🙂 Happy cooking!